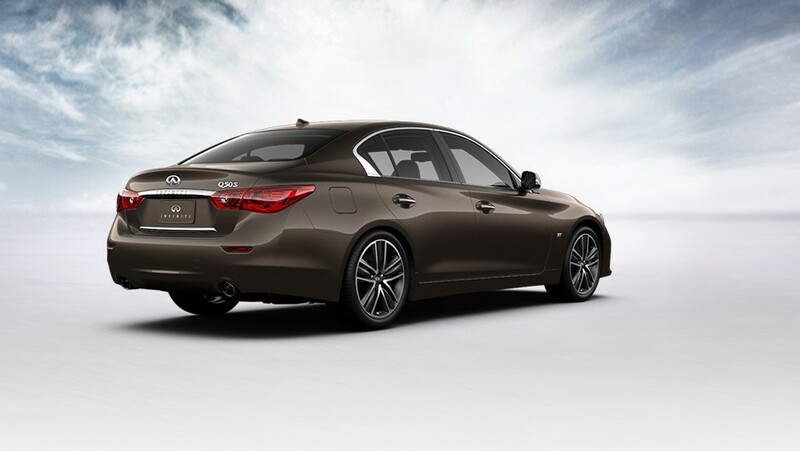 Infiniti’s sedans continue to deliver unique styling that looks muscular and sporty, but with a style that sets them apart from other luxury sport sedans. My test car, the Q50S 3.7 AWD was a great looking metallic brown, with a hint of copper in it, so the color also made this one pop compared with the various silver/gray or black sport sedans that flood the market. Like last week’s BMW 428i coupe, this sporty sedan featured all-wheel drive, making it a perfect fit for our climate and road conditions. Like that BWM, the Q50 comes loaded with luxury and performance items while creating a strong argument for it being racetrack-worthy. 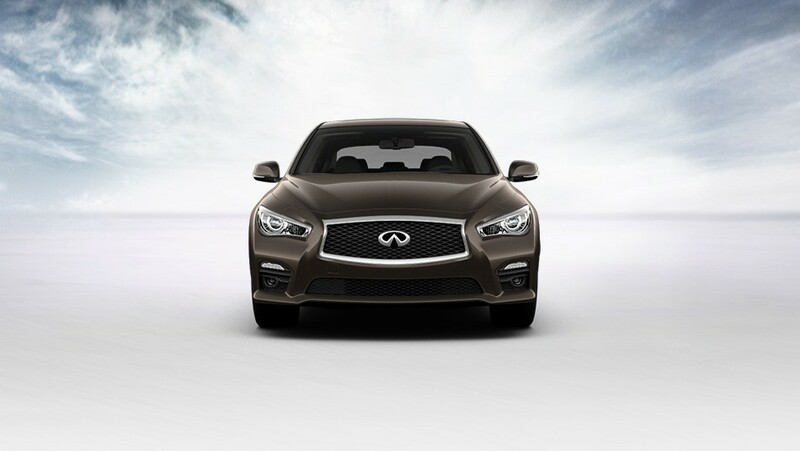 On the performance spectrum the Q, which replaces Infiniti’s popular G Sedan, handles like a fine sports sedan. Steering is quick and responsive and in normal mode quite easy to handle. There’s Drive Mode Select here. That allows the driver to pick Snow, Eco, Standard and Sport. Eco naturally cuts power and changes shift points, while Sport gives the car more oomph off the line while stiffening the steering effort substantially. I feel the Sport mode becomes way too heavy for most drivers to enjoy it, but best to test that yourself if you intend to move up to this level of sport sedan. Standard will be where most folks leave the setting. Certainly the car corners well and the all-wheel-drive gives it sure footing on wet pavement. Power too is strong, but acceleration is not peppy or quick as in either of the recently tested models, last week’s BMW 428i or the Volvo V60 sport wagon. Both had turbos on their smaller 4-cylinder engines to give them instant oomph. Still, the Infiniti’s 3.7-liter V6 has more horses at 328 than either of those models. But torque, which is rated at 269 pound-feet here is what gives you the kick and while good, it’s not the thrill ride you get with a turbo. Shifting from the 7-speed automatic is extremely smooth though, playing up the luxury end of the Infiniti performance equation. Ride from the sedan’s sport-tuned independent front and rear suspension is stiff, making the Q50 feel much mroe firm than some might expect for a luxury car eclipsing $50 grand. You’ll feel major road bumps and creases. In fact, this ride reminds me much of former BMWs I’ve tested, but not the new 4 Series, which is extremely well controlled. 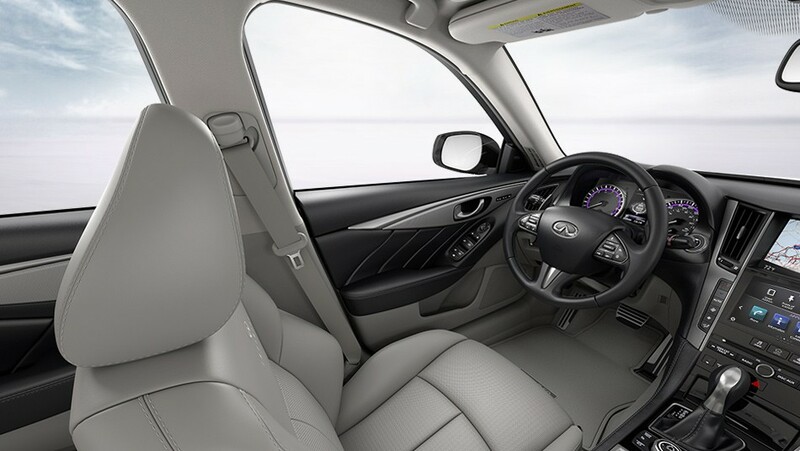 Braking in the Infiniti is top notch with large discs at all four wheels and traction and stability control standard. The car’s interior is what you’d expect at this price point, and maybe a bit more. 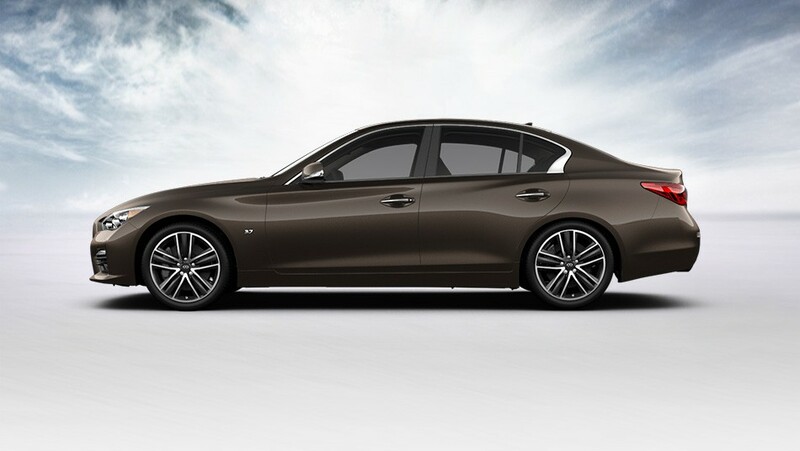 The base Q50 3.7 starts at $38,055, including destination charges, and the tested AWD model lists at $45,000, plus $905 delivery and enough options to hit $50,605. I like the Q’s interior styling, including its real maple trim, part of a $3,100 Deluxe Touring package. The test car was decked out in a black over creamy ivory interior, with leather seats and door inserts, plus the wood trim on dash and doors and brushed metal trim on doors and the center stack. The stack’s face is black while the leather-wrapped steering wheel is brown with metal-look paddle shifters behind it. Infiniti’s dash looks luxurious and features blue rings around the main gauges and digital readouts centered between those gauges. There’s also a big navigation screen with big buttons on the touchscreen face and larger climate control and defrost buttons beside the screen. The only downside with the radio is that it takes quite a while to find a signal and come on after you start the car. That was odd. Seats are comfortable and supportive with 3-level heat, but no cooling elements and no heated steering wheel on the Infiniti, something the BMW had. There are two memory buttons for the power driver’s seat too, so two drivers can pre-select their favorite driving position. The side bolsters also are powered so you can tighten them up if you plan to drive aggressively. Other pluses include sun visors that slide and include a lighted vanity mirror, plus a HomeLink system on the rearview mirror. Infiniti also includes a button to allow you to turn on the rearview camera at will, not just when you put the car in reverse. The sedan comes with a sunroof and shade too. The touring package adds a power tilt/telescope steering wheel that powers away when the ignition is turned off, plus those memory seats and a 60/40 split folding rear seat, which is not so common on luxury sport sedans. Rain-sensing wipers and parking sensors also are part of the package. One negative that I could never pinpoint was a high-pitched whistle at low speeds that sounds like wind. My best guess is that the noise was wind hitting the driver’s side mirror. With a horsey V6 you’d expect moderate gas mileage and that’s what you get here. The EPA rates the Q at 19 mpg city and 27 highway. I got 21.5 mpg in about 60% highway driving. Final word? The Q50 is a stout sport sedan with excellent handling, but firm ride. At $50 grand it’s on the pricey side too. Be aware that a hybrid model is available and starts at $44,400 with the top-level hybrid with AWD going for $49,505 for starters. It features 360 horsepower with a 3.5-liter V6 and hybrid system and is rated at 27 mpg city and 31 mpg highway. The hybrid’s batteries though take up a large portion of the trunk. Hits: Sporty looks and good handling with comfortable heated seats and attractive dash with maple trim. Misses: Ride is on the stiff side and Sport setting makes steering effort way too heavy. Radio takes a while to come on and there’s a high-pitched whistle at low speeds that sounds like wind. Price, like last week’s BMW, is high.